Now I’ve been loving smoothies for the longest time and have been wishing for a smoothie blender for months now. I feel like a blender is not the kind of thing I would usually buy for myself, so I was beyond happy when I found out that Santa had stopped by and put one under the tree for me! Ever since Christmas I’ve been experimenting around and blending everything editable that you could possibly put in a smoothie together. There’s one smoothie I’ve been loving as a quick and easy breakfast though. It’s a super simple recipe but I still want to share it with you guys anyway. Basically what I do is take a handful of frozen blueberries (they don’t have to be frozen but this way your smoothie is instantly cold) chop up a banana, add some natural low fat yoghurt and sprinkle some cereal on top. Then I blend everything together and there’s my breakfast. I absolutely love blueberries and bananas and I think both fruits go well together. I add a bit of yoghurt because for one I just love yoghurt and it makes my smoothie a bit more creamier. As I’ve mentioned before I’m the pickiest eater ever but I love cereal, so since I’d run out of granola I decided to add a bit of my Kellogg’s Special K to my smoothie. Obviously this is an optional step you don’t have to do, but I love it. If you think the consistency of the smoothie is to thick you can always add a bit of milk. But basically this has been one of my go to breakfasts lately! It’s soooo good. If you have any amazing smoothie recipes make sure to link me up with it as I’m trying out something different all the time! It wasn’t until about a year ago that I really got into skin care. Yes, you heard that right. I’ve always made sure to take my make up off before I went to bed at night and I sometimes would use a cleanser and a moisturiser but it wasn’t until a year, that I started investing in more products and building up my own skin care routine. Nowadays I can’t imagine my life without my skin care routine. At least not the night one. I do sometimes lack the energy to do the full routine when I have to get up early in the morning. I’m sure I’m not the only one though. We’re all humans and I belong to the kind, who really appreciate sleep. Just not really a morning person. In today’s post I’m not going to talk about my entire routine but about one product I’ve been repurchasing every time after having run out of it, so I think it’s safe to say it’s become one of my skin care staples within the last few months. 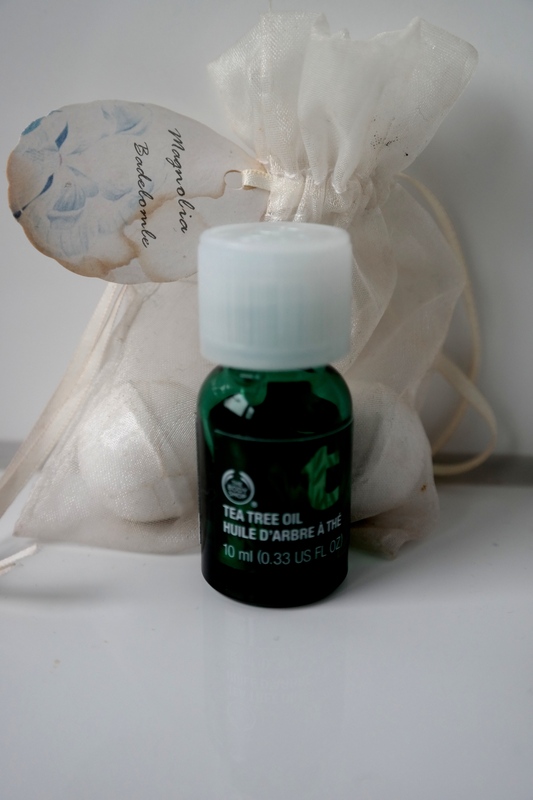 I’m talking about the The Body Shop Tea Tree Oil. 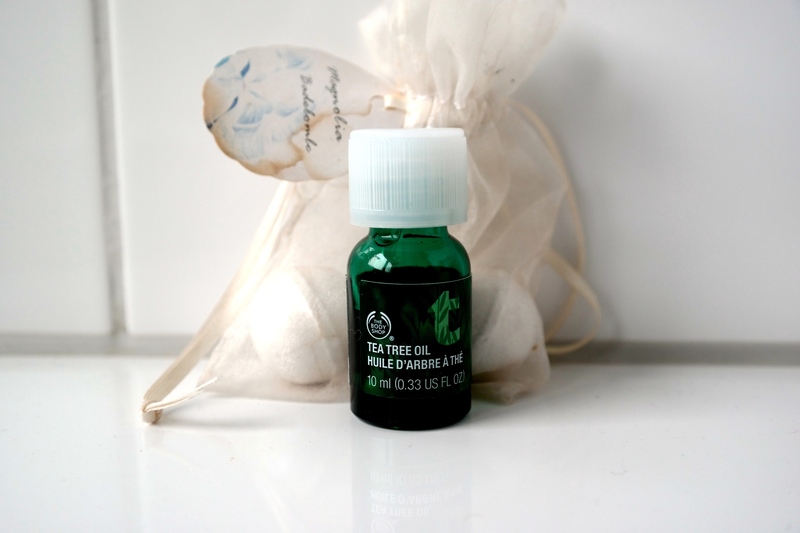 If you’ve ever done any kind of google search on skin care you might have come across tea tree oil and how it’s supposed to be amazing for acne prone skin. I don’t really have, never really had, acne prone skin but for whatever reason I started getting more breakouts when I started university a year ago. Weirdly enough I’ve always had perfectly clear skin until I moved to the Netherlands to start university. I didn’t know whether it was caused by stress or hormones but I did know I wanted to do something against it. Hence I did some google research and came across this little gem. It’s not a magical product, that just makes your skin picture perfect but it has helped my skin to improve immensely in the course of a few months. Now what I do is, I apply a bit of this oil on all the parts of my face, where I think I need it. Basically I cover any blemishes with this. It took some time but my skin has been improving a lot since then and I just love the refreshing feeling it leaves on my skin. It just feels so clean. Although I’m not really a fan of the smell of this product, as it is quite strong, I love this little oil and I’m so glad I discovered it. If you’re struggling with some blemishes or spots I think this is a great product to get rid of those. It leaves a really refreshing feeling on your skin and most importantly it doesn’t dry it out. It’s definitely a product I will continue to use because it’s amazing and really affordable! What are some of your skin care staples? Have you ever tried this? Lately I haven’t been feeling all too well and when I woke up Monday morning I felt so ill I decided to stay home. I hate having to miss out on lectures and seminars because it just means more work in the end because I have to make up a bunch of things, so here are my sick day essentials, that make me feel better quickly. While you’re sleeping your body recovers from all the stuff you put it through throughout the day, which is why a good night’s sleep is so important. Whenever I have a headache or don’t feel well I snuggle up in bed and try to get some sleep, so that my body can rest and get better. Drink lots of water! Water is so good for you and your body needs it to stay hydrated. I tend to drink not enough water during the day, which sometimes leads to headaches for me. If you like drinking something warm go for green tea. I’m not much of a tea person but I love green tea. It is so healthy and really good for you. I’m the kind of person if someone texts me I always try to text back asap because I don’t want to keep them waiting. This can be really stressful especially when a lot of people are expecting answers and you’re really busy with something else. If I have my phone around me I can never really rest, so if you’re anything like me just turn it off. You will survive it and so will your friends if you are unavailable for a few hours. Nothing is more comforting than your favorite most comfortable clothes. When I’m sick I’m usually not very hungry, so I like to eat fruits and veggies to get vitamins and energy from them. This are my five essentials for a sick day, that will usually get me back on track quite fast. What do you do when you’re not feeling well?